a) The damage to the environment during mining or harvesting of the basic material. b) How much damage in relation to the quantity of materials (what else is disturbed or damaged?). c) The source, size, or renewability of the basic material. e) Waste residue, solid or liquid, in production. f) The air pollution due to manufacture and production. h) The energy consumed during transportation to site of usage. i) The energy consumed on-site for erection or assembling. j) The on-site waste and packaging. k) The maintenance required during the life-cycle. l) The environmental impact during the life-cycle (i.e, toxic emissions). m) The energy and effects associated with demolition/disposal at the end of the life-cycle. n) The recyclability of the demolished/dissembled material. Now what does this look like? Glass is usually pretty energy intensive. 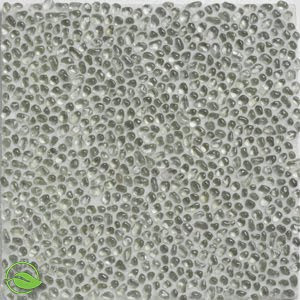 But this tumbled glass tile from Modwalls is a great solution to not having to re-fire the recycled glass in the kiln. Recycled lumber is probably one of the best sustainable solutions for using wood on a project. Crossroads Recycled Lumber specializes in recycled lumber construction and their projects seem to show it. 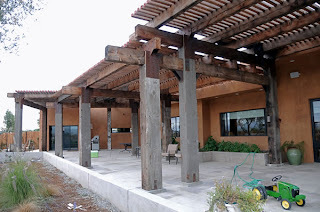 They have an almost endless gallery of recycled and reclaimed wood projects. Locally quarried natural stone has been on the topic of discussion as to whether it is sustainable or not. So when taking a deeper look into stone resources in California there were limited options but one Granite Quarry in Clovis, CA that produces black and grey granite. I'm awaiting some samples as I type. Wish I had some to post. Though the water feature at the US Federal Courthouse in Fresno, CA was designed using granite from Clovis, CA. 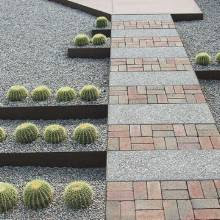 Here are some other paving alternatives. I don't believe that these products are one size fits all solution. I think that every project is unique considering the design intent as well as budget and client. 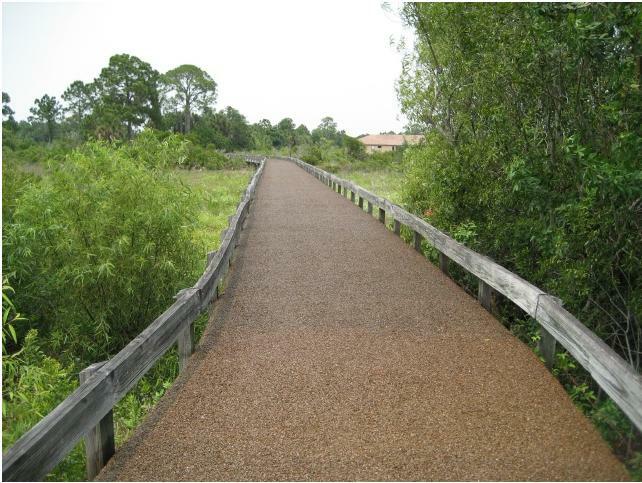 Permapave are a porous paver that are grouted in a polymer concrete set on top of a gravel base. These pavers act as a filter that prevent runoff contaminants from entering the storm drains and help recharge local groundwater. Concrete paving companies have been coming out with several permeable pavers that allow the water to infiltrate between the joints of the pavers. 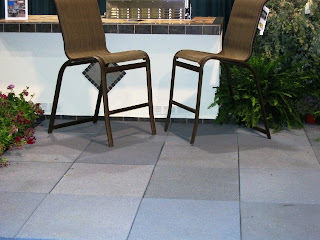 The come in almost any earth tone color imaginable and can be patterned in several different styles. Flexi pave is a porous paving that is a great substitute for asphalt paving. It uses recycled products and comes in several colors. I would recommend it for light traffic areas and not parking lots because it tends to loosen with heavy automobile traffic. 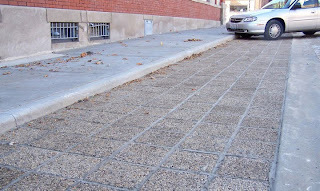 Rubber sidewalks are another concrete substitute that many cities have started to use for paths along street trees. 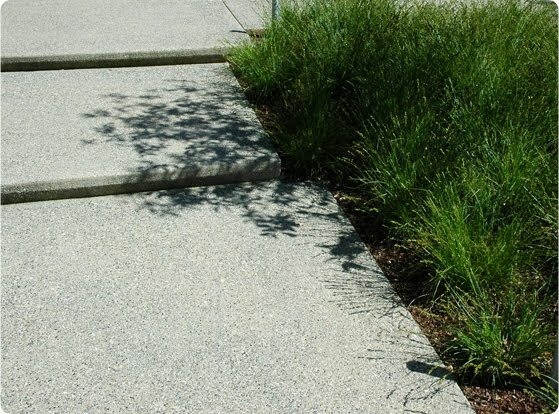 They are a recycled composite paver that allows tree roots to grow underneath them with out having to destroy and re-pour new concrete on city sidewalks. Through my little bit of research I've learned that the practice of sustainability really comes from the designer taking the time to investigate the products available and determine how "sustainable" they really are. From there we can start to understand the materials such as their benefits and limitations. After that, we can begin to get creative! 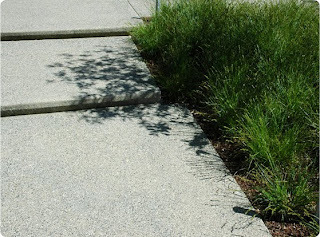 Landscape Architecture creates landscapes that evolve and change. Let's change it into something good.